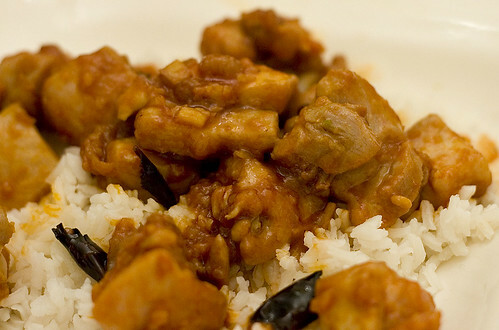 One of the very first posts I made to this blog was a version of General Tso’s Chicken. That version was from Changsha in Hunan province and is fairly close to the version served in America (and, strangely, rarely in Hunan province). Now, well over a year later, I tried my hand at the Taiwanese version (and succeeded in not gassing myself out of the kitchen this time). Apparently, this is closer to the original General Tso’s Chicken which was developed in the 1950’s in Taiwan by a Hunanese chef, Peng Chang-Kuei. He’s also responsible for the other style of General Tso’s Chicken, which is hot and sweetand was developed in New York City. This version is hot and sour, without the sweetness of the more American version. Despite the fact that this was not developed in Hunan itself, this version is more Hunanese as it doesn’t have the sweetness. Of course, the unspoken issue is which is the more authentic version. I do appreciate authenticity in cooking but I don’t think it matters in this case. The supposed canonical example of Hunanese cuisine isn’t Hunanese at all. I don’t think there can even be an authentic version of this dish. So if authenticity doesn’t matter, which is better? It’s really hard to say (not the least because of the time delay between the two). I remember liking the Changsha version a lot despite the high spiciness. The Taiwanese version is much more challenging to my taste buds. I’m simply not particularly used to food that is hot and sour. Angela enjoyed the Taiwanese version a lot; she was already asking when I could make it again. So my advice is simple. Make both this version and the Changsha version and see which you like better. Or realize that they’re different enough that you can enjoy both. Cut the chicken thighs into similiarly sized, bite size pieces. For the marinade, combine the soy sauces and egg yolk with the chicken and mix well. Then stir in the potato flour. Finally, stir in the potato flour or corn starch. Set aside to marinate for 30 minutes. Combine the sauce ingredients in a bowl. Cut the chilies into 3/4″ pieces and discard the seeds. 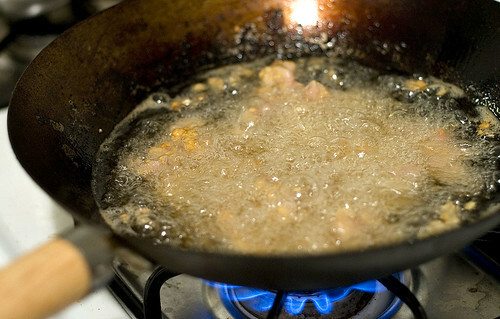 Heat enough oil to deep fry the chicken in a wok until it reaches 350ºF. Add the chicken and deep fry until the chicken becomes crisp and golden. Remove the chicken and drain on paper towels. Pour the oil from the wok into a heat proof container. 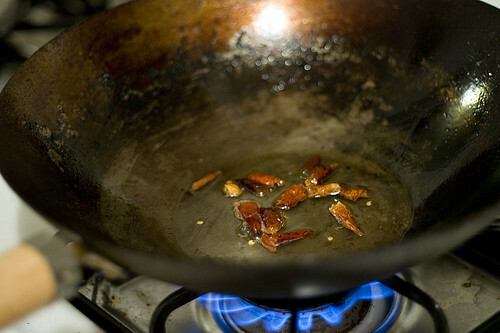 Return the wok over high heat and add 2-3 tbsp of the peanut oil. Add the dried chilies and stir fry until they start to turn brown. Add the ginger and garlic and stir fry for several seconds. Add the sauce and stir regularly until it thickens. Return the chicken to the sauce and stir to coat the pieces in the sauce. Remove from the heat. Stir in the sesame oil. Serve immediately over white rice. Please look at what you wrote for the chillies. I think it is suppose to be 6-10 chillies not ounces. If it is ounce then it is a lot. There would be more chillies then chicken. Anyways I made your recipe and put only one ounce for double the recipe. Again please edit the amount of chillies in the recipe. Thanks. It was a very delicious dish that I will make again with using less chillies.